There are currently more than 8,000 total baptized members worshipping in 31 congregations (including Saint Luke's) in the Episcopal Diocese of West Tennessee. Though not the mother church of the diocese, Saint Luke's was the first congregation in West Tennessee, being founded July 23, 1832. Composed of both rural and urban parishes and missions, the Diocesean ministries also include Emmanuel Episcopal Center and St. Columba Conference Center. The seat of the Diocese is St. Mary's Cathedral which was consecrated in 1858 and served as a refuge during the Yellow Fever epidemics. It also played an integral part of the civil rights movement in the city in the 1960s. The Episcopal Diocese of West Tennessee, encompassing 21 counties from the Tennessee River on the east, including a small portion of Hardin County across the river, to the Arkansas/Missouri border on the west, was incorporated in union with The General Convention of The Episcopal Church on December 31, 1982. The first Bishop of the Diocese was the Rt. Rev. 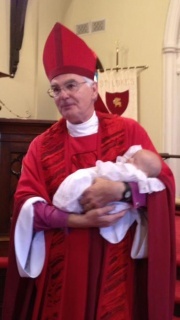 Alex Dockery Dickson, consecrated on April 9, 1983 and retired in September 1994. He was succeeded by the Rt. Rev. James Malone Coleman, consecrated on November 13, 1993 and retired in June 2001. The third and current Bishop of West Tennessee is the Rt. Rev. Don Edward Johnson, having been ordained bishop in March of 2001. Bishop Johnson is the chief pastor of the parishes in the Episcopal Diocese of West Tennessee and he visits Saint Luke's frequently. The Episcopal Church in West Tennessee invites all people, as God’s beloved, into communities of Christian Faith, Love and Service. The Episcopal Church in West Tennessee is a welcoming community of believers with many voices, yet one faith in Jesus Christ, united in the Book of Common Prayer, nurtured by the sacraments and empowered by the Word of God for our ministry in the world.